Comments: Broadleaf evergreen native to Australia. 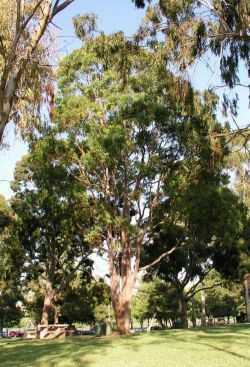 This tree species is a close relative to the eucalyptus. Leaves are lanceolate, opposite on the stem and have the same green color top and bottom (concolorous). 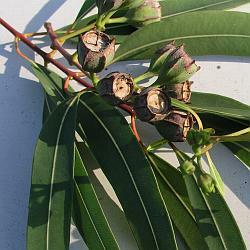 The ribbed gumnuts of the Angophora differ from the eucalyptus and have pointed calyx lobes instead of an operculum (lid). This species has a smooth red colored bark. Specimen is 30' tall but mature trees can be 100' or more in height. This tree has been tentatively identified as Angophora costata.